IoT Buses – Go-IoT – The one stop solution for your IoT needs! DINGO BACKBONE brings all the different sensor & actuator protocols to one common interface. Mix Modbus, M-Bus, 1-Wire, GPIOs, USB, I2C, etc. in the same installation without complications. Today there is a lot of sensor/actuator hardware installed using different communication protocols. When an IoT solution is installed it has to be able communicating with all of this different sensors/actuators, rather than having to replace the already installed hardware. In addition it is very convenient being able picking what ever sensor or actuator that fits a new installation. 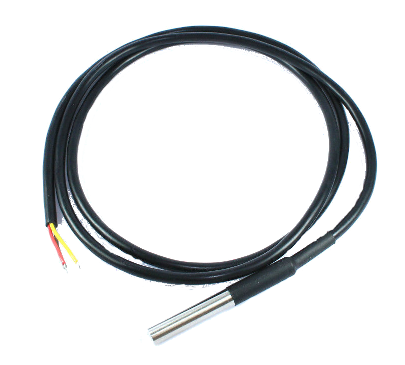 For example 1-Wire temperature sensors are very cost effective and easy to install, while Modbus enabled energy meters are cheap and give a lot more information than old style S0-pulse-meters. The disadvantage mixing sensors/actuators using different protocols, is that it becomes a nightmare configuring the system. DINGO software stack solves this problem with its Peripheral Manager (DPM). DPM is a kind of language translator, that translates all the different protocols to one simple set of GetValue and SetValue functions. In addition configuration is made easy by so called device templates for different sensor/actuator types. Templates are stored in the DINGO database. Installers only have to drag and drop such templates to the actual configuration to enable the the particular sensor/actuator-devices, using DINGO Manager. New templates can easily be made for new devices from their data-sheet. Below we discuss shortly many of the sensor/actuator protocols currently supported by DPM. General-purpose input/output (GPIO) is a generic pin from the DINGO Computer Board (DCB) whose behavior—including whether it is an input or output pin—is controllable by software at run time. GPIO pins have no predefined purpose, and go unused to the DINGO Base Board (DBB) by default. In DINGO Manager (DM), GPIOs are configured properly for each type of DBB. On DBBs variants DINGO-BB-2ST-01 and DINGO-BB-3ST-01, eight GPIOs are used as Binary Inputs from the screw terminals. Those can be used for pulse counting S0-pulses from consuption-meters, or as ON/OFF sensors. 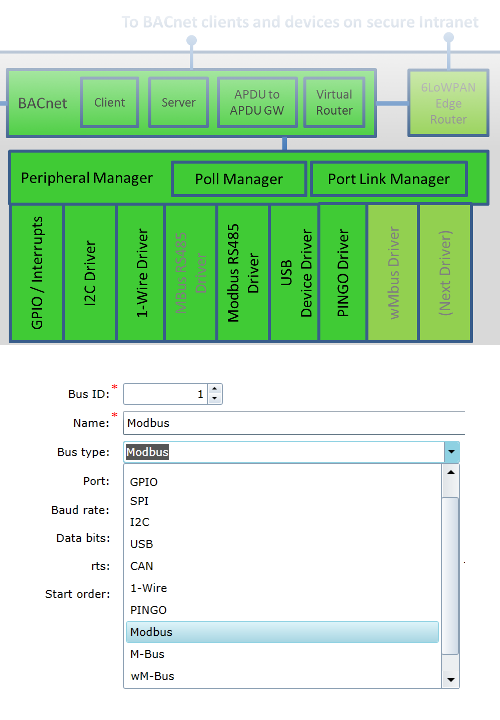 Other GPIOs can be configured to control some of the DINGO Plug-ins, for example the PINGO plug-in. GPIOs can be configured to cause system interrupts to the DINGO Peripheral Manager (DPM). This avoids polling the GPIOs. Such interrupts can be configured to be on falling edge, rising edge or both edges. DPM also contains a module for debounce cleaning, to avoid false on/off switching from noisy input-contacts. Debounce timings and pulse lengths are easily configured in DM. 19 GPIOs go from DCB to DBB. Templates for different GPIO configuration and different DCBs exist in the DINGO database. All very easily configurable in DM. The I²C bus was designed by Philips in the early '80s to allow easy communication between components which reside on the same circuit board. Philips Semiconductors migrated to NXP in 2006. DINGO Computer Boards (DCB) have two I²C buses. Both buses are feed to the DINGO Base Board (DBB) for communicating to whatever I²C enabled chips might be there. The buses are also feed to the plug-in sockets on the DBB. Miscellaneous DPM templates exist in the DINGO database. For example there are templates for the TCA6424A port extender and TLC59116F LED driver, both from Texas Instruments. It is very easy to create new templates for I²C connected chips. It is just a matter of putting the vendors data-sheet information about the chips registers into the DINGO database. 1-Wire is similar in concept to I²C, but with lower data rates and longer range. It is typically used to communicate with small inexpensive devices such as digital thermometers, relays and weather instruments. A network of 1-Wire devices with an associated master device is called a MicroLAN. One distinctive feature of the bus is the possibility of using only two wires; data and ground. All DINGO Computer Boards (DCBs) have 1-Wire on 3 pins in the multi-port RJ45 Connector. 1-Wire sensors/actuators can be daisy-chained from that port using for example our MINGO product MINGO-RJ45-SPLITTER-01. More templates can be easily created, using the above ones as reference. Modbus is a serial communication protocol originally published by Modicon (now Schneider Electric) in 1979 for use with its programmable logic controllers (PLCs). Simple and robust, it has since become a de facto standard communication protocol, and it is now a commonly available means of connecting industrial electronic devices over RS485. All DINGO Computer Boards (DCBs) have RS485 on two pins (RX/TX) in the multi-port RJ45 Connector. Modbus can be run on those or using the more powerful RS485 DINGO plug-in. Modbus devices can be daisy-chained from the multi-port using for example our MINGO product MINGO-RJ45-SPLITTER-01. Note that Modbus and 1-Wire can coexist over the same cable from the multi-port. This is very convenient and saves a lot of cabling work, if both protocols are used. Creating new templates in DINGO Manager is a breeze. 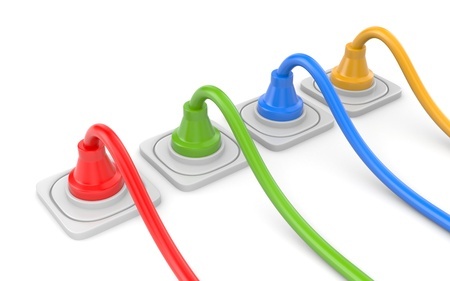 When there are no dedicated wires to communicate over or wireless is not working because of stone walls, metal cabinets or building/soil- shadows, there is only one media left. That is the existing power-lines in buildings and streets. Surprisingly enough experience has taught us that this is frequently the case. This method is normally used for DINGO BACKBONE (master) to multiple DINGO BACKBONE (slaves) communication over power-lines, when no other communication media is available. DINGO Pass-through (DINGO-PH-BB-01) is used to extend RS232, RS485 or USB over power-lines (or WINGO). In this case the PINGO plug-in shows up in the software as RS485, RS232 or USB port. This for example enables Modbus to be run over the power-lines. PINGO communication is performed via the PINGO plug-in installed into DINGO Base Board or DINGO Pass-through Base Board. DPM templates are not used for PINGO, as it is only a physical media that does not define any device or sensor protocol. M-Bus (Meter-Bus) is a European standard (EN 13757-2 physical and link layer, EN 13757-3 application layer) for the remote reading of gas or electricity meters. M-Bus is also usable for other types of consumption meters. The M-Bus interface is made for communication on two wires, making it very cost effective. Our DINGO M-Bus plug-in is intended for collect data from M-Bus meters. The M-Bus driver in DPM performs a kind of translation back and forth between M-Bus and BACnet. For example the definition for MBus unit-of-measure is translated to BACnet unit-of-mesure. This translation can be turned on or off all after if BACnet is using the M-Bus driver or not. Each M-Bus meter on the bus has to be defined in DPM using DINGO Manager. That is relatively simple by dragging and dropping templates to the bus-configuration. The Wireless M-Bus standard (EN13757-4:2005 and 2012) specifies the RF communication link between water, gas, heat, and electric meters and the data collecting devices and is becoming widely accepted in Europe for smart metering or Advanced Metering Infrastructure (AMI) applications. Wireless M-Bus was originally targeted to operate only in the 868 MHz band, which gives a good trade-off between RF range and antenna size. Recently two new bands (169MHz and 433MHz) have been added to the wM-Bus specification as well, introducing narrow-band solutions with much higher link budget and thus providing longer range solutions than at 868MHz. There exist both 868 and 433MHz variants of the WINGO plugin. Therefore both short range and long range Wireless M-Bus are supported. (See products DINGO-PG-WINGO900-01 and DINGO-PG-WINGO400-01 here... ). From upper layer software view, there is no difference between wireless- and wired M-Bus. USB sensors and actuators are popular by makers and kids. Those are most often used from a PC. As we want to encourage IoT learning we decided to support USB in DPM. Some templates exist in the DINGO Database, for example for the popular Microdia TEMPer, temperature sensor available from Ebay and other locations. The advantage and fun using those with DINGO BACKBONE is that no driver installation is needed and those kids and makers get hold on the temperature immediately via industry standard BACnet. This is much more fun to play with than a simple windows-program just showing the temperature. With DINGO BACKBONE the kids/makers can easily link the temperature, etc. to a BACnet TrendLog object, subscribe to COVs via BACnet/WS from a web page they make and more. DINGO support for USB sensors and actuators adds extra fun to those products.